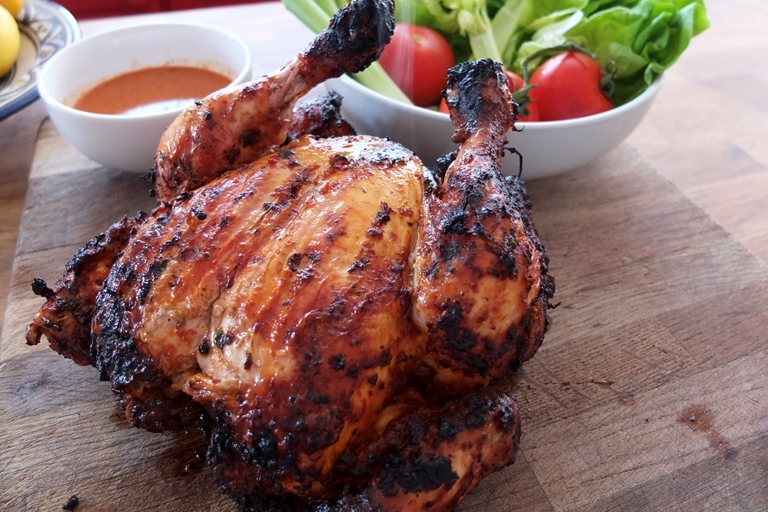 This piri piri chicken recipe is perfect for a summer barbecue. Helen Graves uses the simple technique of spatchcocking her chicken before grilling on the barbecue to ensure it cooks quickly and evenly. The homemade piri piri marinade beats any shop-bought version hands-down. This is a fantastic recipe for the barbecue, based on the Portugese piri piri preparation. Don’t be put off by the amount of chillies or vinegar here, they mellow out as the chicken cooks, forming an addictive sour and spicy glaze. Serve with a green salad and chips or rice.